mcarterbrown.com - DSG "Shorty" Parts Kit Interest Thread! DSG "Shorty" Parts Kit Interest Thread! Okay guys, I saw that a lot of people with DSG's were expressing interest in shortened feed tubes, and also the 8 round "Shorty" version that Dukie cooked up using spare parts. It would take a bare minimum order of 10 to even start thinking about a discount. It would also be an undisclosed amount of time before Dukie could get to making them (DRV production, real life, etc). What I was thinking would make the most sense would be a 10 round tube system made long enough to clear the original pump handle, so that its compatible with standard 10 round loading systems and doesn't require paying for other parts like a shortened pump handle or arms. But, Dukie's not 100% sure a 10 round tube would clear the original pump handle. So I'll leave it as a poll. Please ONLY vote if you are a DSG owner and are interested in actually purchasing these kits (and please be honest with yourself as to your ability to pay in a timely fashion). I'll be linking this to Dukie so that he can correct me if I butchered this info in any way shape or form. I just want a shorter lower tube. Yeah, I would prefer it to be 10 rounds, but if it's less $$ to just go with what works with the stock handle/arms, then that would be my choice as well. 10 round with shorter part options is what I would prefer. I'm gonna have to think about this if I'm gonna have to choose. I'm in for a short version though. If Dukie ever did a lever action version of the DSG and I bought it, I would want the 10 round version. I'll stay out of the poll though. My vote is for option A. From what I can tell the size is going to have to be more then 10 I'd look at the gun of someone that has a short feed and a larger fed marker. Honestly I think the size may have to be 12. That is a good size because you then have a spring for the last two balls in your ten round tube(rather then tilting it) and an extra two balls ready to shoot. 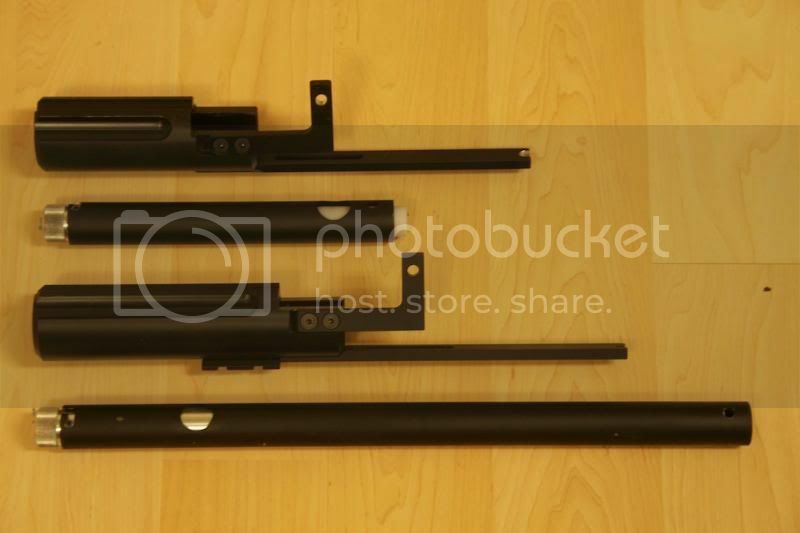 Does anyone have a picture of a shorty with the long parts below it for comparison? If anyone wants more specific shots of the original vs the 8 round shortened tube and pump - post here what you want and tonight I can get them done and posted here for you. The feed would have to be redesigned before I would make a purchase, though.